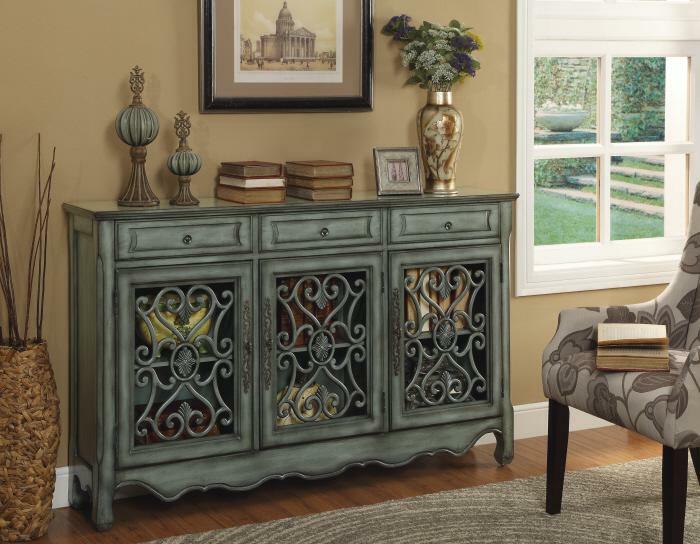 European flair and rustic accents make this three drawer credenza one of a kind. Finished in a neutral Hood Grey, the architectural details are enhanced by the aged patina. The three doors are a work of sculptural art, created by hand forged Pewter Metal, in a graceful curved pattern. Glimpses of the interior shelves can be seen. The Coast to Coast Accents 3 Drawer/ 3 Door Credenza by Coast to Coast Imports at Miskelly Furniture in the Jackson, Pearl, Madison, Ridgeland, Flowood Mississippi area. Product availability may vary. Contact us for the most current availability on this product.